This glamorous bed will be the perfect centerpiece in your bedroom. 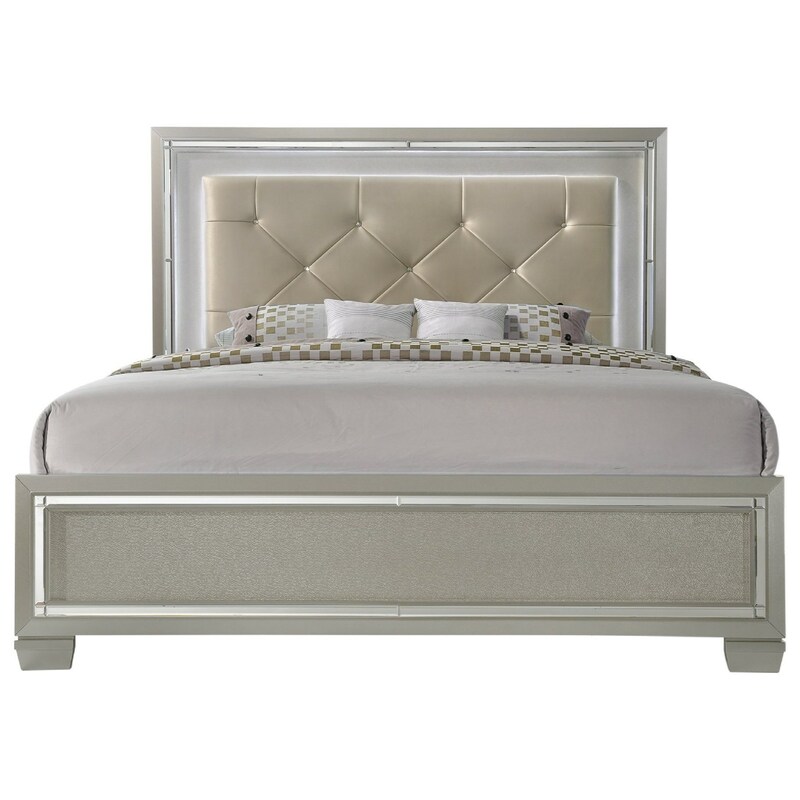 The headboard on this chic bed is upholstered with diamond tufting and has a mood lighting built around the edge. Mirror trim and a fashionable champagne finish add additional sparkle to this eye catching bed. Pair with matching storage pieces from this collection for an updated and unique set of bedroom furniture. The Platinum King Upholstered Bed with Mood Backlighting by Elements International at Furniture Fair - North Carolina in the Jacksonville, Greenville, Goldsboro, New Bern, Rocky Mount, Wilmington NC area. Product availability may vary. Contact us for the most current availability on this product. This fashionable and chic collection of bedroom furniture will be a wonderful way to update your home. The contemporary collection features a stunning champagne finish with mirror trim and crystal accents, resulting in a glamorous and unique set of furniture. Adding to this distinct collection is the diamond tufted upholstered headboard with built in LED mood lighting. The Platinum collection is a great option if you are looking for Glam Contemporary furniture in the Jacksonville, Greenville, Goldsboro, New Bern, Rocky Mount, Wilmington NC area. Browse other items in the Platinum collection from Furniture Fair - North Carolina in the Jacksonville, Greenville, Goldsboro, New Bern, Rocky Mount, Wilmington NC area.